Sarah's Silks is my absolute favorite sustainable costume company. We have been collecting Sarah's Silks for several years and their quality is stellar. My daughter has dressed up in her Sarah's Silks costumes for the past two Halloweens, and I find her playing dress-up in them daily. Sarah's Silks makes silk Waldorf inspired costumes for boys and girls as well as canopys, playsilks, blankets, toys, and more. Herein I highlight several of my daughter's Sarah's Silks costumes (and I include one Sarah's Silks costume idea for boys as well) to give you ideas for Halloween costumes for your own kiddos! Sarah’s Silks reversible two-colored Cape comes in eight different color combos as well as three patterns. They are 32″ long, so they can fit most 3-8 year olds. The cape can be worn with a crown, veil, wizard hat, or princess hat. The Sarah’s Silks crowns are also reversible and available in five different color combos. Sarah’s Silks Fairy Dress may be worn over a long-sleeve shirt and pants if it is chilly outside. 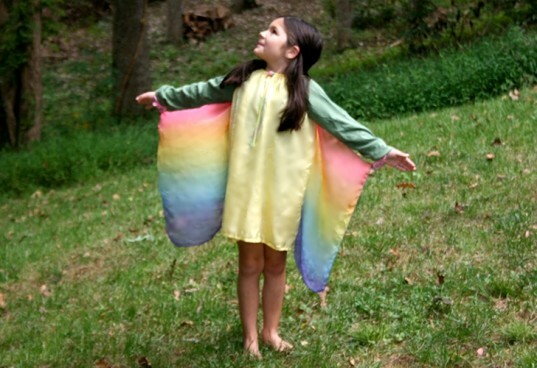 The wings are connected to arm bands, so when your child runs, the wings will “fly.” The dress is 24″ and can be worn by 3-6 year olds. Though, older children can wear the dress with leggings. 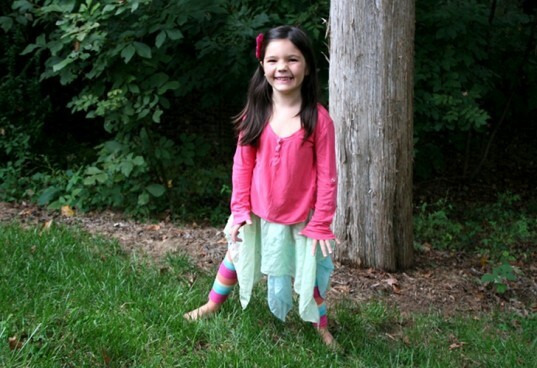 Sarah’s Silks Fairy Skirts are reversible and available in seven different color combinations. They are also available in two sizes, small and large, which will fit 2-4 and 4-8 year olds. The skirts can be worn over leggings, tights, or pants and paired with leotards, tees, capes, garlands and more. The costume ideas are endless! We misplaced our Sarah’s Silks mermaid top, but we used a playsilk in its place! 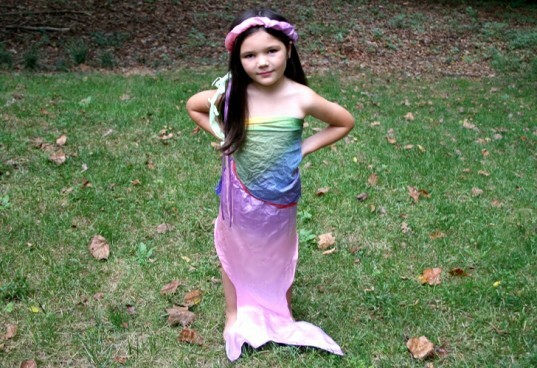 The Mermaid costume comes in two sizes, small and large, and can fit kids ages 3-6 and 6-9. It also comes with a seaweed and ribbon garland. 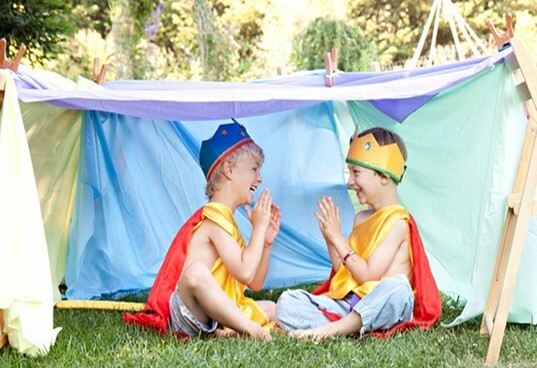 The playsilks can be used as tops, skirts, headbands, belts, wrist bands, peek-a-boo toys, and in many other ways. There are over twenty playsilk colors to choose from and three different sizes. My daughter’s favorite costume is the Princess Dress. This too can be worn under a long sleeve shirt and pants if it is chilly outside. The dress is available in two colors and is 30″ long. The dress can be paired with a princess hat, crown, or garland. Sarah’s Silks makes a number of boys costumes including capes, crowns, swords, wizards, dragons, a knight tunic, and of course playsilks. The boys above are wearing the Knight costumes with Crowns. Sarah's Silks reversible two-colored Cape comes in eight different color combos as well as three patterns. They are 32" long, so they can fit most 3-8 year olds. 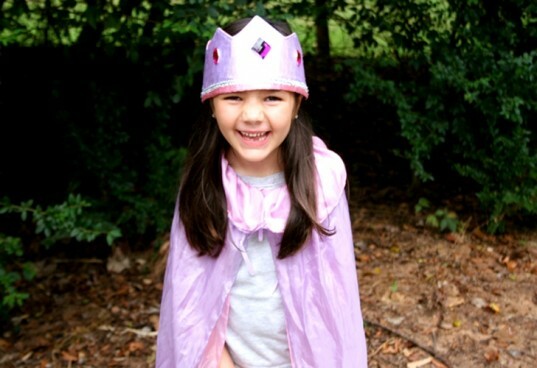 The cape can be worn with a crown, veil, wizard hat, or princess hat. The Sarah's Silks crowns are also reversible and available in five different color combos. Sarah's Silks Fairy Dress may be worn over a long-sleeve shirt and pants if it is chilly outside. The wings are connected to arm bands, so when your child runs, the wings will "fly." The dress is 24" and can be worn by 3-6 year olds. Though, older children can wear the dress with leggings. Sarah's Silks Fairy Skirts are reversible and available in seven different color combinations. They are also available in two sizes, small and large, which will fit 2-4 and 4-8 year olds. The skirts can be worn over leggings, tights, or pants and paired with leotards, tees, capes, garlands and more. The costume ideas are endless! We misplaced our Sarah's Silks mermaid top, but we used a playsilk in its place! The Mermaid costume comes in two sizes, small and large, and can fit kids ages 3-6 and 6-9. It also comes with a seaweed and ribbon garland. The playsilks can be used as tops, skirts, headbands, belts, wrist bands, peek-a-boo toys, and in many other ways. There are over twenty playsilk colors to choose from and three different sizes. My daughter's favorite costume is the Princess Dress. This too can be worn under a long sleeve shirt and pants if it is chilly outside. The dress is available in two colors and is 30" long. 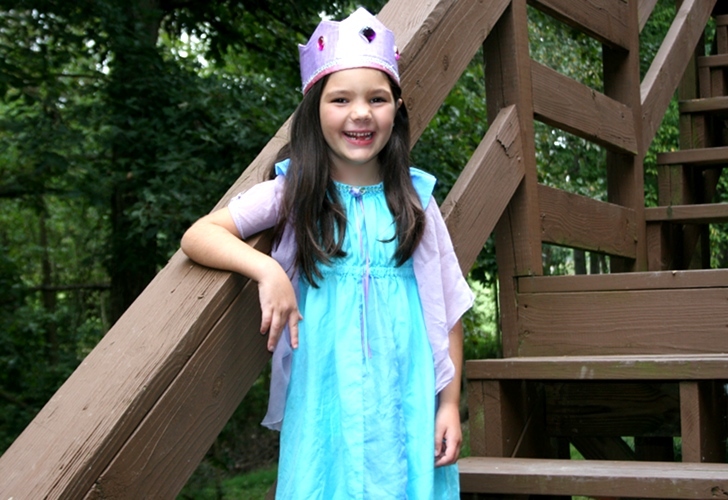 The dress can be paired with a princess hat, crown, or garland. Sarah's Silks makes a number of boys costumes including capes, crowns, swords, wizards, dragons, a knight tunic, and of course playsilks. The boys above are wearing the Knight costumes with Crowns.